Keating, an associate professor of animal science at Iowa State, studies human and animal reproduction. 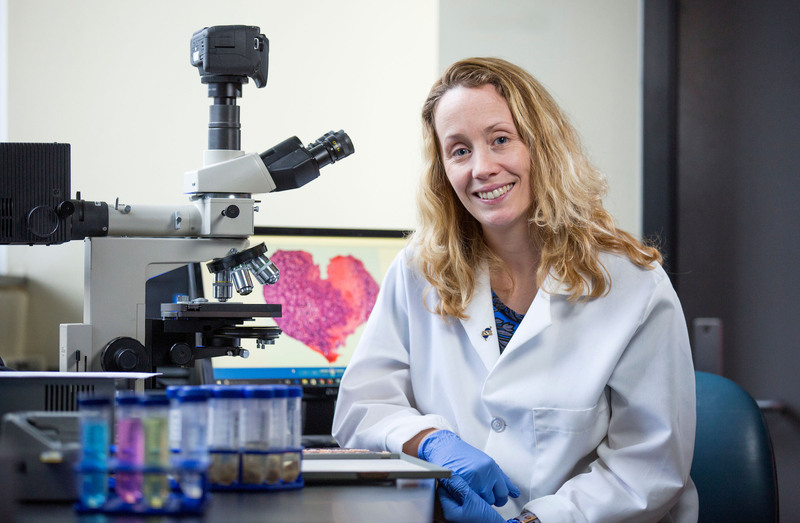 Her research takes on questions regarding how factors such as environmental stress, obesity and chemical exposure affect female fertility, and her work has important implications for both animals and people. She developed an affinity for animals and the outdoors during her childhood in Galway, Ireland, before studying biomedical science, microbiology and biochemistry. A sense of discovery and a dedication to research tie all of her experiences together. Keating’s research focuses on female reproductive health. She’s investigated how a range of variables, including heat stress and chemical exposure, affects fertility in pigs. The research helps pork producers identify and implement practices that lead to more efficient, safer conditions for sows and piglets. Her work also has implications for human health. Keating received a three-year, $150,000 Bailey Research Career Development award in 2017 to investigate how obesity affects ovarian capacity. She’s also looking into how fertility changes for women who have received chemotherapy. “We also study what factors are important for producing a good-quality egg to be ovulated so that the offspring that develop from that egg can be healthy and viable and have no problems for their lifetime,” she said. For instance, she said her lab is a leader in studying the additive effects that obesity and chemical exposure have on the function of the ovary. Keating said some forms of chemical exposure can damage the DNA structure of eggs inside an ovary, but the ovary has some capacity to repair that damage. However, obesity can impair that reparative capacity, she said. Keating said many of the lessons derived from studying rodents and production animals also apply to human physiology. Though many of the animals she studies carry litters rather than a single offspring, as human women typically do, the same factors that stress animal fertility often have similar effects for human fertility, she said. That means studying model animals can pave the way to new insight into human reproduction. Aileen Keating in her Kildee Hall laboratory. Photo by Christopher Gannon. Larger image. Looking back on her childhood near Galway, located on the west coast of Ireland, Keating describes herself, her brother and two sisters as “country kids.” She recalls spending time outdoors exploring and an early interest in animals. She considered pursuing veterinary medicine but decided to study microbiology, biomedical science and biochemistry instead. She conducted postdoctoral research in mammary physiology in animals at the University of Alberta in Canada before she became a research associate at the University of Arizona to study reproductive physiology and toxicology. She joined the animal science department at Iowa State in 2010. Keating said her commitment to research guided her career. She said students in her lab sometimes grow frustrated when the data they collect don’t show strong results, but Keating said that’s all part of the scientific process. Every experiment, whether it produces dramatic results or not, fills in a blank that can inform future research, she said. “It’s all useful and adds to the scientific knowledge,” she said.